Bank notes (often known as a bill, paper money, or simply a note) is a type of negotiable instrument known as a promissory note, made by a bank, payable to the bearer on demand. Reserve Bank has the sole authority to issue banknotes in India. Reserve Bank, like other central banks the world over, changes the design of banknotes from time to time. Banknote or Currency notes reflect the nation’s rich and diverse culture, her struggle for freedom and her proud achievements as a nation. With a view to bringing the identity closer to the cultural heritage of the country as also for showcasing her scientific advances, a new series of notes in a new design is being launched. The new design bank notes are distinctly different from the current Mahatma Gandhi Series of bank notes in colour, size and theme. The theme of the new series notes is India’s heritage sites. A few new other elements added in these notes are numerals in devnagari and the logo of Swachh Bharat. The new notes also have design elements in myriad and intricate forms and shapes. 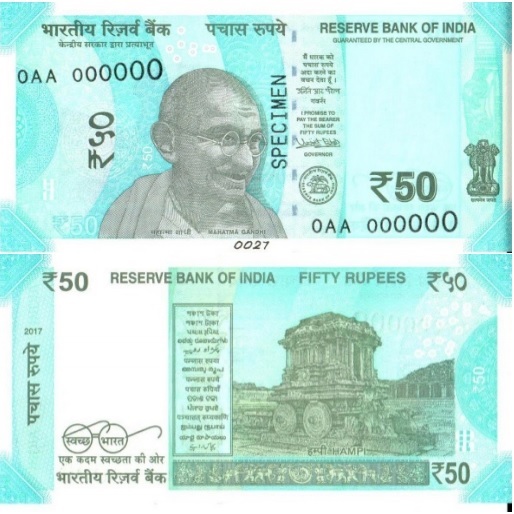 While the security features in the current series of bank notes, such as water mark, security thread, latent image of denomination numeral, denomination numeral in colour shifting ink, number panels, see through register, electro-type, bleed lines, etc., continue to remain, their relative positions may have changed in the new design notes. New denomination Rs 200 banknote : When ATM will dispense ?